The Brattleboro downtown art scene has grown more sophisticated in quite distinguishable leaps in the last year. A number of new art venues have opened their walls up, and the enlargement of Gallery in the Woods and the opening of the Catherine Dianich Gallery have upped the bar of professionalism in matters of display and curating, as well as in a business sense. The "scene" has become more dimensional in the area of performance and in after-the-galleries hang-out options. This is due to the opening of two very successful "art bars," the WeatherVane Gallery & Club and the Metropolis Wine Bar & Cocktail Lounge, both on Elliot Street. For many, the first association with the word Metropolis is the city in the "Superman" comic strip--calling up images of the building with the giant globe on top, home of the newspaper The Daily Planet, where Clark Kent liked to arrive for work by the front door and leave by the window. Visitors to the Soho-like atmosphere at the Metropolis Wine Bar may be doing a walk-in/float-out number, too, these days. And floating out onto the streets of Brattleboro, they may wonder if they've just time-and-space-warped out of hip downtown New York City. The interior of the bar is itself an artwork, and an acute sense for detail has taken every element of the interior space into imaginative and focused attention. Lights are impressive, with tracked halogens over the bar and at the front of the space on an arced track. Two lights mounted on the wall look like cornucopias made of shell, simultaneously bountiful and delicate. The round copper tables have heavy iron bases that resemble the bases of city light poles. The bar made of cherry wood and black granite exudes excellent craftsmanship, as does nearly every surface the eye alights upon. Fabric is also a considered element, and the soft couch-like backing for one group of seats is a sumptuous expanse of purple. All of the furniture and the architectural treatment of the space (upstairs and in the wine cellar and small party room downstairs) mesh beautifully to create a harmonious atmosphere, both comfortable and aesthetically provocative. At the entrance, like a welcoming deity, stands a large wooden Indian sculpture adding a worldly and exotic note. Matt Blau and Kristin Anderson, proprietors of Metropolis, are the former owners of Max's, a very successful restaurant in West Brattleboro that is also a first-Friday Gallery Walk venue. The eight years that they owned Max's must have given them very specific and well-considered ideas as to how to do things right. At Metropolis they have done it in amazing style while bringing Brattleboro an element of "citycool" formerly absent and very supportive of the art scene. Since November and continuing through January, the work of artist Doug Trump is on display at Metropolis. There are two canvases and one work on paper in the main room and four more paintings downstairs in the party room. Doug's work is well known in New York City, where he has exhibited extensively, but he also was a founding member of the Windham Art Gallery here in Brattleboro. Doug's painting seems to bring very specific influences, from different decades, together in a succinct style of abstract painting. Spatially and in a design sense, California abstractionist Richard Diebenkorn seems to be the Father. Add to this the childlike, cartoonish drawing of Jean-Michel Basquiat, a personal feeling for color which seems urban-derivative, and occasional architectural reference, and you've got a pretty close recipe. Whites, grays, black and red can be seen as strong color elements, recalling the masonry landscape and bright moments of color punctuation in the city. Surfaces are built up with collaged elements that are often in turn painted over, adding a physical dimension to the ground. These collaged pieces, always cut in squares and rectangles, create underlying verticles and horizontals, which in combination with the occasional use of a straight edge in drawing, make the comparison to Diebenkorn an easy one. 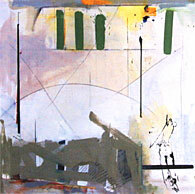 Oil paint, pencil, ink, and collage are used in the largest painting upstairs, entitled "Double A." This nearly square composition is busier in the top half of the painting. The ground there is rich with under-collaged shapes and two stick-like bars of wood, which are painted over. A broad red stripe crosses horizontally and is in turn crossed by a series of diagonals, resembling the way prisoners count time in a cell, scratching on the wall, counting in fives, one scratch crossed by four. The small stripes made with medium-valued tones do not seem to cut the red but rather ride upon it. 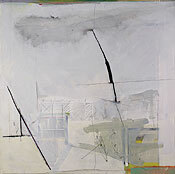 The upper portion of the painting has a ground of light ochre, and below is a gestural washing of gray. These colors appear to be metallic, however, because of contrast and color context. Landscape space is playfully alluded to by a blue and white graphic slash across the painting, which might suggest a horizon were the same line not continued vertically down the left side of the painting, breaking that space and flattening the composition. There is no exploration of deep space, rather a consistency of shallow, graphic space providing the work with a strong physical presence and tactile focus. Giving the painting its title are two deftly scrawled capital letter A's in the upper corners, left and right. Because of their childlike character, they are immediately reminiscent of the controversial work of the now-deceased Basquiat, '80s-New York graffiti artist and painter. They contrast with the straight ruler-drawn lines and add visual dimension. Trump's use of pencil and ink are also reminiscent of the famous street artist, who was known for using conventional materials in an unconventional way. Quickly and expressively rendered figures are drawn into the compositions in many of the paintings. They seem more to be design elements than descriptive information, as they are loose and nonspecific. They might recall the social experience in modern urban environments where uncountable souls pass by, leaving faint impressions, but are living entities nonetheless. Trump likes to use large two- and three-inch brushes when creating his gestural grounds. Smaller brushes glide next to a straightedge and create firm, clean graphic lines. He likes a rich ground and uses a build-up, destroy and rebuild process, as Picasso advised. We feel him searching, dashing on the color, then painting it out, looking for vibrant doses of subtle contrast, moments of the juicy. These isolated color areas of quiet acidity provide some of the more interesting details in these abstract paintings. The presence of strong abstract painters in Brattleboro such as Doug Trump, Mia Scheffey, Petra Sairanen and others would seem to point out--no, scream out!--that we still do not have an art dealer here focused on contemporary painting, though there are plenty of artists with contemporary visions to view and pick from in our little town. Yes, I'm saying the word Abstraction; yes, I'm saying Installation. Interested?